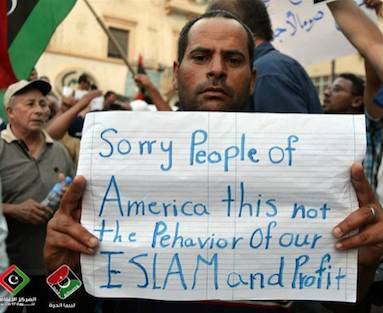 Libyans held a pro-America rally last night expressing regret and shame for the attacks on the American embassy that resulted in the deaths of U.S. Ambassador Chris Stevens and 3 others. A CBS reporter on the scene said there is a sense of shock and anger toward those responsible for the crimes. See more inspiring photos on the image site: imgur.com. this is really moving… i have to say… it is exactly the message the world needs… i personally am blown away by how a million people travel to mecca each year and worship in peace… that is Islam… and its extraordinary what occurs there during the Hajj.